But it can't be from Dolly Clackett. She gave me an Easter egg! : I'm so gorgeous, there's a six month waiting list for birds to suddenly appear, every time I am near! I'm so gorgeous, there's a six month waiting list for birds to suddenly appear, every time I am near! Hello loves! Half a week into being back at work and I am still having trouble readjusting to being back. Isn't that silly, but I suppose three weeks of almost complete indolence can have an effect on a person. I promise I will stop whining about having to go to work and everything, but I am still missing home. My relationship with Northern Ireland isn't complicated - I know I don't want to live there, but I still hate leaving. It's always a bit harder after Christmas as well, because I've been able to spend so much time with my family. This Christmas was great because my younger sister had the whole holiday off as well, so we were able to spend lots of time together, and I spent ages just sitting around chatting and drinking coffee with my mum and dad. And, as those of you who follow me on twitter or instagram will probably know, Daddy solidified his hero status by reviving my long-deaded 2006 iBook G4. I bought it when I was doing my PGCE in 2006 and it died tragically last year when the socket for plugging in the power pack broke, so the battery wouldn’t charge. This was really annoying because I had only just bought a new battery and I knew that the computery bit of it was still working, it just couldn’t get power to it. The Apple shop said they’d charge £70 to even look at it, and that they probably wouldn’t be able to fix it anyway, and a local computer shop said they probably couldn’t fix it but even if they did, it would cost about £200 when they charged for labour and parts. So I stowed it under the sofa, reluctant to sell it for parts – just reluctant to part with it, really, because I am very sentimental and that wee computer and me had lots of good times together. Open-heart surgery in process on my mac. He had to go out and buy a new headlamp part-way through because his own headlamp failed. WHAT A GUY. He didn’t watch the video – what use does a man like Eugene have for mere instructions? – he just busted her open using a razor blade to pry the casing apart. Well, but more gently than that. He discovered that the problem was that the top of the pin from the charger had broken off and become stuck in the socket, shorting out the power lead. So he put in a new socket using an old one from something else, he fixed the power thing because it was back to front (reversing the polarity, which made me chuckle big style) and put the whole thing back together! We had to take it apart once more to reattach the track pad (which I had detached the first time round) and to fix the little pulsing light that shows you the computer is on. But bam! 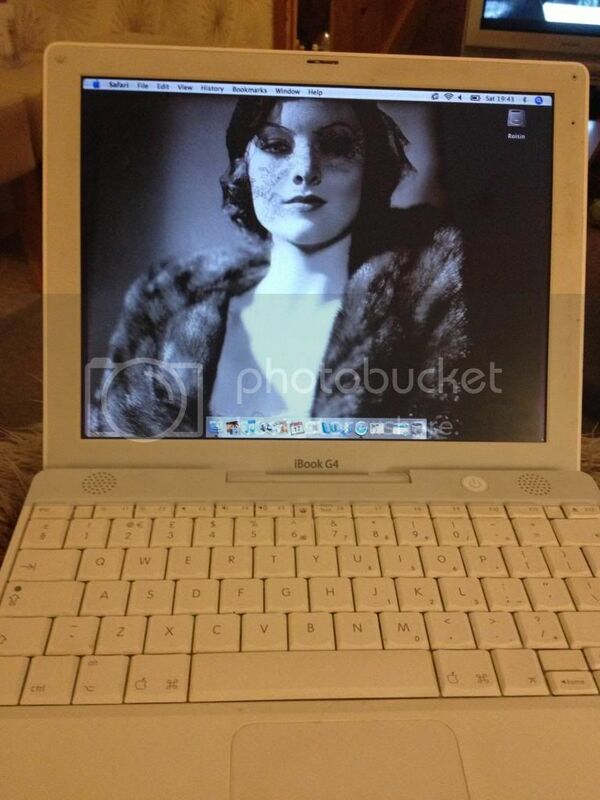 I have a working iBook once again! It was almost like getting a new laptop for Christmas. So sorry for the boring IT story but I felt a bit bad for calling Daddy a nuisance in the last post when actually I think he’s brilliant. So that was all very exciting, especially as I was able to assist by holding things when necessary, and by reattaching the track pad. Hurrah! So I’m not really too sad to be back, because I did get to spend lots of lovely time with my family. It always makes me feel very blessed. Well, not ALL about the sewing as I did some grocery shopping and went out for a walk. I haven’t worn this dress in a while but when I opened the wardrobe it was beckoning to me. It’s one of the few dresses in my wardrobe that I paid full price for but I think over the years it has proved its value because it’s smart and comfortable and unusual. These shoes are one of the pairs I bought when I was at home and they’re fab – Zoe Greenhill is an independent designer and it looks like she’s pretty influenced by Irregular Choice. These were for sale in three of my home town’s shoe shops, two of which also sell Irregular Choice and they’re a good budget option. I love the bow and the purple heel! Anyway, Sunday was lovely. I spent a good few hours sewing New Look 6000 (it needed some adjustment) while Nic worked and then in the evening we curled up on the sofa and watched the last few episodes of Season 4 of Fringe. I’ll tell you more about the sewing in the next post when I’ve had the chance to photograph the frock!